I can’t tell you how much I have appreciated the supportive and encouraging comments I received on my last post. 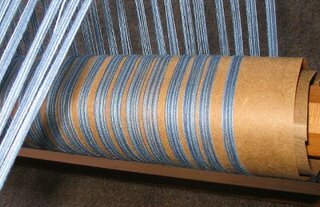 It’s especially interesting to read when and why weavers choose one method of warping over another. This is helpful information! In doing my research I realized that there is no one single way to warp b2f. I chose Chandler’s instructions, and occasionally refer to Osterkamp. For the most part things have gone pretty well so far. Using a counting thread while measuring the warp. I really liked this however. It seemed easier to count and keep track of groups of 12s rather than counting to 864. Placing packing sticks to separate the layers of apron cords as I wound them on. I didn't used to use anything to separate the layers of warp until I got to the the knots which tied onto the back apron rod. Sitting at the front of my loom to thread the heddles. As mentioned above it's easier with the warp closer to me. Plus, I found that my empty beater makes a convenient little shelf for my book, scissors, and threading hook. Weighting the warp with a heavy box on the floor as I wound on. Giving the group an additional jerk before moving on to the next group. I understand now that the “valleys” between these groups create uneven spots and hence potential differences in tension across the width of the warp. The only things I can think of are to try and keep the warp spread out in the raddle better (next time). Or perhaps my raddle spaces are too far apart(?) 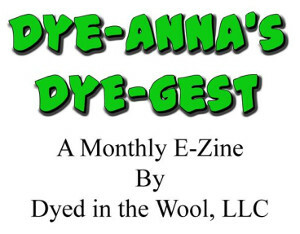 They are ½ inch and I am using 16/2s cotton sett at 24 epi. Progress will probably be a bit slow, as I've only begun to thread the heddles. But I am motivated, so hopefully it won’t be too long before I can see how well I’ve done and start weaving. Leigh, When I warp back to front, I put the raddle in the beater, where the reed usually goes. The warp then travels over the lease sticks before going over the back beam to wind on the warp beam. My raddle has 1" segments, and I've woven at 36 epi w/ it. So I don't think your 1/2" raddle spacing is the difficulty. In the first photo, you can actually see the bunches that I just finished pulling. 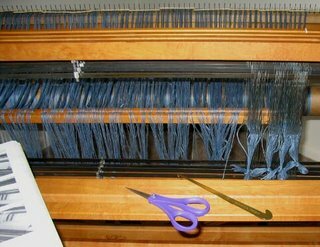 With this method, There might occasionally be a bit of space between the warp on the back beam, but for the most part, everything is evenly spread. I forgot to say that if you can take the front beam off, do so and you will not have to reach as much. 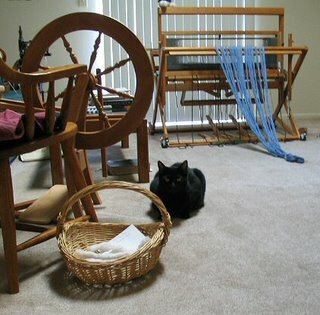 It looks like you have a jack type loom and I put blocks under my harnesses to raise them when I am threading so that I don't have to stoop as much.